Put the fork down! If you’ve ever tried to diet away some extra pounds, those are some of the most annoying words in the English language. But being more aware of what you put into your body is one of the most effective ways to cut down on calorie consumption and shift that unwanted weight. 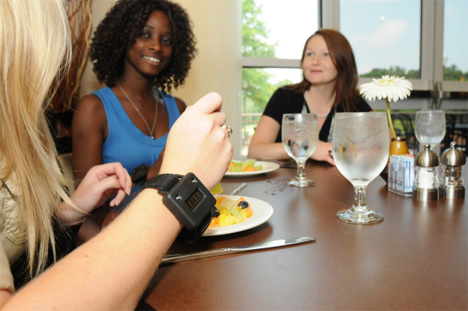 A team of researchers from Clemson University have invented the Bite Counter, a kind of pedometer for your eating habits. The device fits on your wrist just like a watch and counts the wrist-roll motion you make when taking bites of food from a utensil. It certainly isn’t a calorie measurement device since it doesn’t track the type of food you are eating or the nutrients in your meals, but it can help to give you a rough idea of just how much you’re putting into your mouth at every meal. According to the researchers, the device is over 90% accurate when counting bites regardless of variables like person, utensil, food or container. The device is already being manufactured and the team behind its creation have applied for a patent on the design. The real promise of the Bite Counter might not be for personal weight loss, but for research. And since the gadget will run around $800, it will probably be out of the price range of the average weight watcher anyway. See more in Home & Personal or under Gadgets. August, 2011.